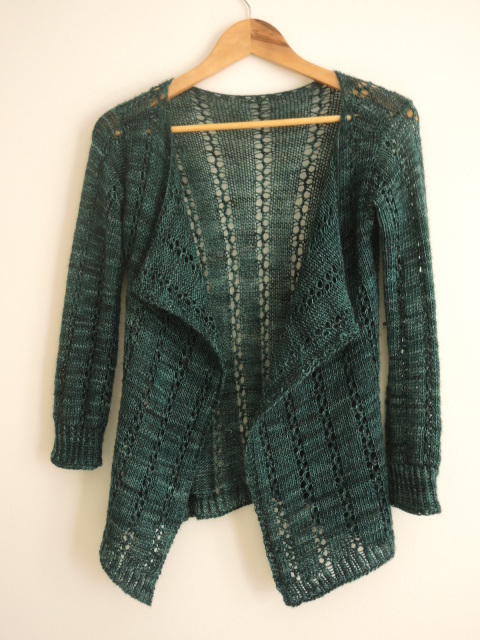 A gorgeous cardigan with a cosy garter stitch shawl front and pretty smocking details. This cardigan is totally seamless. Fiacaill is knit from the top down, starting at the back shoulders working down to the armpit, we then pick up stitches at the front of the shoulders and work down to the armpit at the front. All stitches are worked down to the hem with the decorative smocking pattern across the middle section, this adds waist-shaping to the cardigan without increasing and decreasing stitches. We pick up stitches around the armholes and work the sleeves down to the cuffs, and pick up stitches around the front for the oversized shawl front. Fiacaill is named for the Fiacaill Ridge in the Cairngorm Mountains, and is part of a series of knitting patterns based on my travels in the Highlands of Scotland. 820 (950, 1095, 1250, 1420, 1580, 1750, 1930) yards. US 7/4.5mm needle after blocking. Needles: One US 7/4.5mm 40”/100cm circular needle. needle for weaving in loose ends. 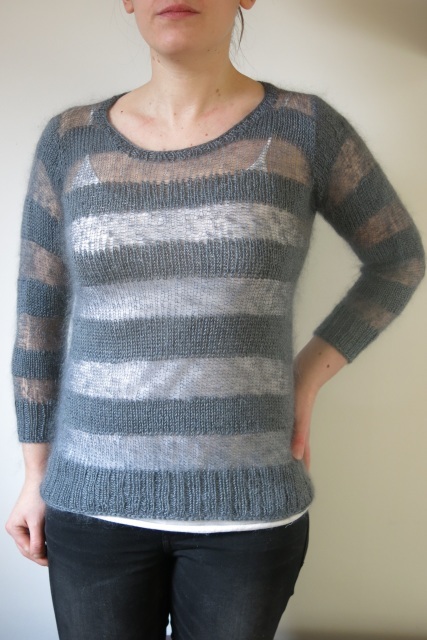 A classic fitted sweater with sheer and solid stripes. We alternate between airy, lightweight mohair silk lace yarn used by itself and held together with a buttery soft 4ply blend of merino and silk. 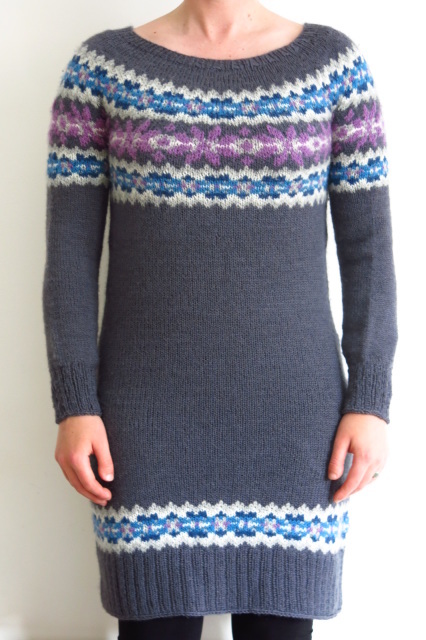 This sweater is light as a feather, like wearing a fluffy cloud, but it certainly excels at keeping the chill at bay! You can replace the 4ply yarn with any yarn of this weight, but we really would recommend using a mohair silk blend for the laceweight yarn. This sweater is seamless and knitted from the top down, and the sleeves are worked from picked up stitches around the armhole and shaped with short rows. Instructions for 10 sizes are given: to fit bust 32 (34, 36, 38, 40, 42, 44, 48, 52, 56)”. To fit bust: 32 (34, 36, 38, 40, 42, 44, 48, 52, 56)”. 0.75-1.75 inches of ease around bust dependent on size. Armpit to hem: 18 (18, 18, 22, 22, 22, 22, 26, 26, 26)”. Around top of sleeve: 13 (14, 15, 16, 17, 18, 19, 21, 22, 23)”. Sleeve length from armpit: 14.5 (14.5, 15, 15, 15.5, 15.5, 17, 17, 17.5, 17.5)”. 930 (1020, 1060, 1370, 1435, 1505, 1590, 2030, 2190, 2380)yds. 400 (430, 460, 595, 620, 640, 685, 880, 935, 1010)yds. One 5mm / US 8 40”/100cm circular needle. 16 sts and 24 rows = 4” in stocking st with both yarns held together using 5mm/ US 8 needles. Waste yarn, 6 detachable stitch markers, spare 40” circular needle (size 5mm / US 8 or smaller). 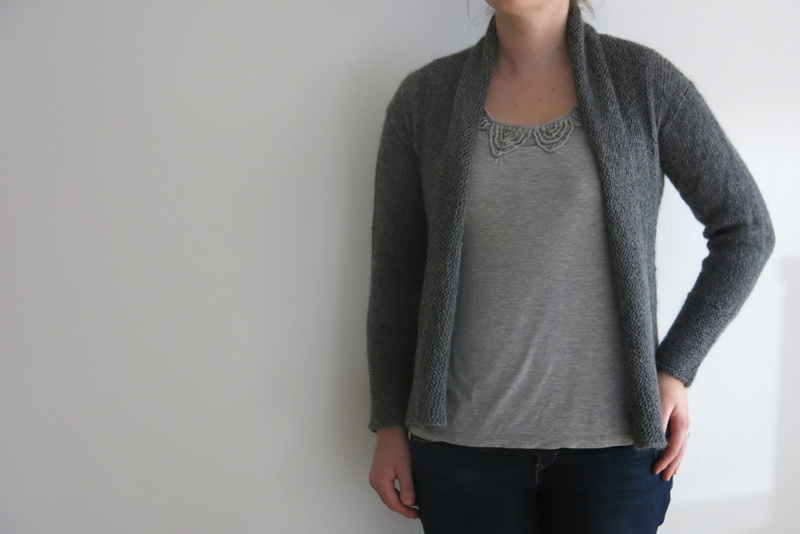 A fitted cardigan with a flattering drape front. 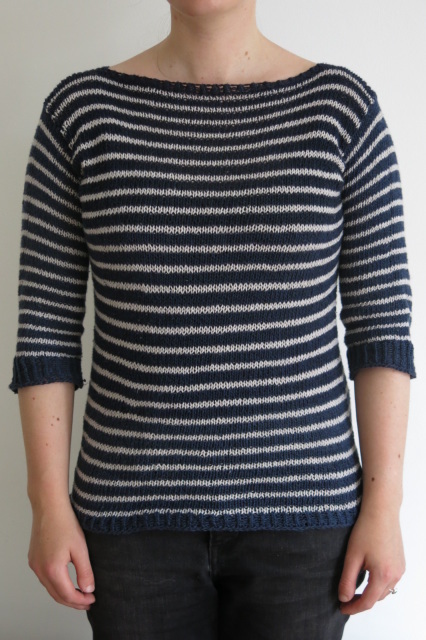 Moseley in Spring is knitted from the top down with set in sleeves and neat ribbed edgings. 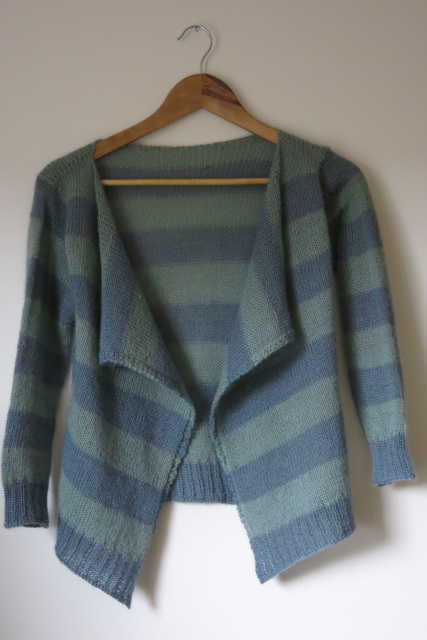 A lightweight, and ever so slightly cropped version of our classic Moseley Cardigan in 4ply yarn with cute stripes. A perfect transitional piece for sunny Spring days. Instructions for 10 sizes are given: to fit bust 32 (34, 36, 38, 40, 42, 44, 48, 52, 56)”. Across Back Armpit to Armpit: 16 (17, 18, 19, 20, 21, 22, 24, 26, 28)”. Armpit to hem: 12 (14, 14, 16, 16, 18, 18, 20, 20, 22)”. Around top of sleeve: 12.5 (13, 13.5, 14, 15.5, 16, 17, 18.5, 19, 20)”. Sleeve length from Underarm: 15.5 (15.5, 15.5, 15.5, 15.5, 17.5, 17.5, 17.5, 17.5, 17.5)”. Baa Ram Ewe Titus 4ply (50% Wensleydale, 20% Bluefaced Leicester, 30% UK Alpaca; 350 yds (320m) per 100g). MC Bramley Baths 440 (540, 575, 680, 715, 840, 875, 1050, 1140, 1320) yds. CC Aire 440 (540, 575, 680, 715, 840, 875, 1050, 1140, 1320) yds. MC Bramley Baths 400 (485, 520, 620, 650, 760, 795, 950, 1040, 1200)m.
CC Aire 400 (485, 520, 620, 650, 760, 795, 950, 1040, 1200)m.
One 4mm / US 6 40”/100cm circular needle. 21sts and 28 rows = 4” in stocking st with 4mm/ US 6 needles. Waste yarn (you’ll need about 1yd/1m), 6 detachable stitch markers, spare 40” circular needle (size 4mm/US 6 or smaller). We all know from school that letters are used to replace “unknown” numbers in Mathematics, but there are actually many conventions about which letters should be used for what purpose. We often use x and y for variables in equations, f for a function, c for a constant term. We use many Greek letters too. Gamma (γ) often denotes a curve, phi (φ) is often used for functions too. The Greek letter epsilon (ε) is almost always reserved for a very, very small unknown number. While it might be tiny it often forms the crux of proofs, especially in the branch of Maths called Analysis. This shrug might be pretty tiny too, but could end up being just as crucial to make a special dress look perfect! 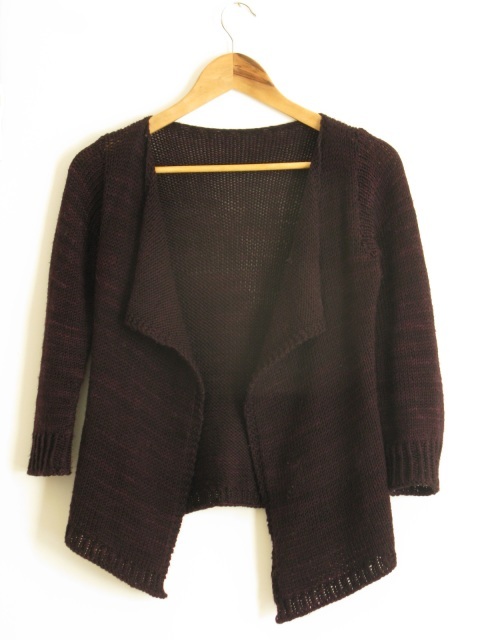 This cropped cardigan is knitted from the top down using a yoked construction. Both charts and written instructions are given for the lace sections. Please check all measurements below before deciding what size to knit and note that this shrug has about 1” negative ease, so if you prefer a looser fit you may wish to go up a size. Instructions are given for eight sizes: to fit bust 28-30, 32-34, 36-38, 40-42, 44-46, 48-50, 52-54 and 56-58. Yarn: Abstract Cat Superwash Bluefaced Leicester Sock Yarn 400m/100g. Needles: One 4mm / US 6 40”/100cm circular needle, one set of 4mm/US 6 dpns if preferred to magic loop, one 6mm/US 10 40”/100cm circular needle for initial cast on. Gauge: 24 sts and 30 rows = 4” in stocking st with 4mm/ US 6 needles. Extras: Waste yarn, 2 detachable stitch markers, embroidery needle for weaving in loose ends. 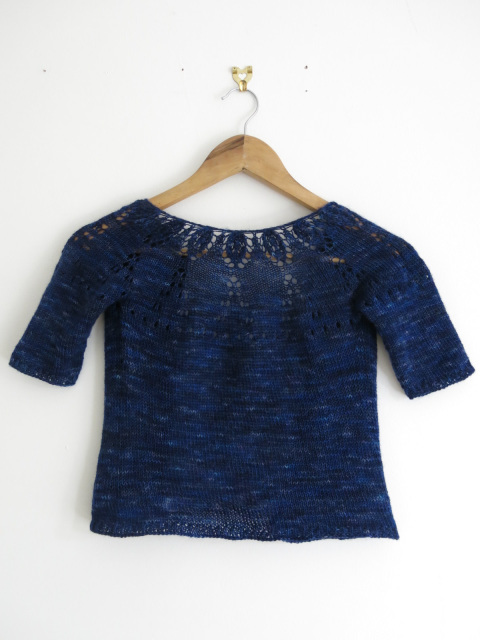 A beautiful, delicate top that’s quick to knit - even in laceweight yarn. The ideal Summer knit, something lightweight that still looks stunning. The lace pattern looks impressive but is simple to knit. This really is a top you can dress up or down. 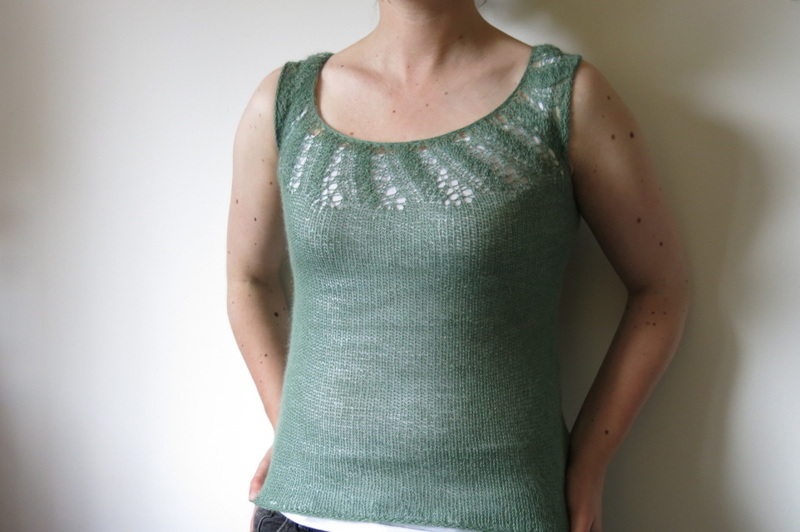 This tank is knit from the top down with a yoked construction. Stitches from the front and back of the yoke make up the body, and extra stitches are cast on at the underarm. The hem and sleeves have an attached i-cord edging to keep everything neat and to stop edges from curling. There are more stitches at the front than the back to provide a better fit and to give a pretty scoop neck. The pattern gives 10 sizes - to fit bust 32 (34, 36, 38, 40, 42, 44, 48, 52, 56)“. Yarn: Rowan Fine Lace in colourway “Patina”. prefer not to; two 4mm/US 6 dpns for i-cord bind off. Extras: Two stitch markers, waste yarn, embroidery needle for weaving in loose ends. A fitted cardigan with a flattering drape front in a pretty lace pattern. 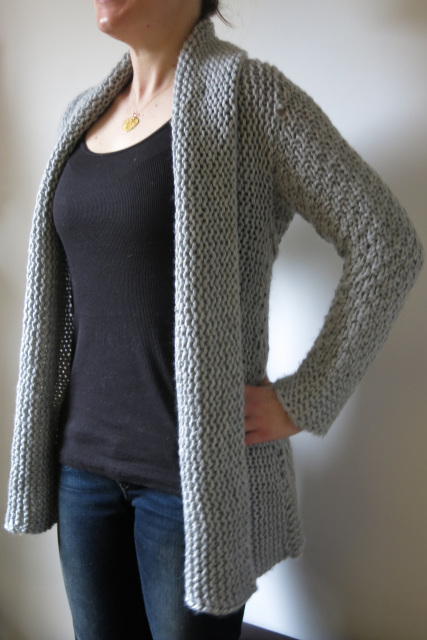 This is a simple but stunning knit that could be dressed up or down. Queen’s Park Cardigan is knitted from the top down with set in sleeves, neat twisted rib edgings and an oversized blanket front. Using sportweight yarn on larger than normal needles and blocking creates an airy fabric with beautiful drape. The lace pattern is simple and suitable for a first lace project, with only a four row repeat. Instructions for 8 sizes are given: to fit bust 28-30 (32-34, 36-38, 40-42, 44-46, 48-50, 52-54, 56-58)”. Yarn: Madelintosh Tosh Merino Light 2 (2,3, 3, 4, 4, 5, 5) skeins. Total yardage: 720 (840, 975, 1135, 1310, 1525, 1750, 1965) yards. Needles: One 5mm / US 8 40”/100cm circular needle. One 4.5mm/US 7 40”/100cm circular needle. If you prefer using dpns or a shorter circular needle for sleeves, you will need these in both sizes. Gauge after blocking: 16sts and 22 rows = 4” in Queen’s Park Lace with 5mm/ US 8 needle. Extras: Waste yarn, 2 stitch markers, spare 40” circular needle (size 5mm / US 8 or smaller). 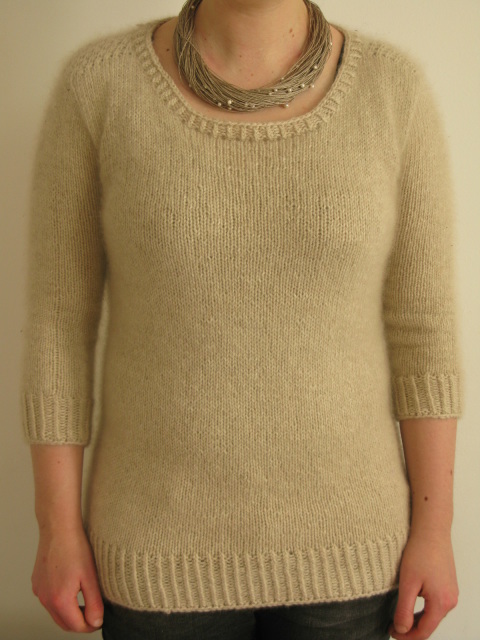 A classic sweater in a cotton/linen blend to keep the chill at bay on Summer evenings. Cute nautical stripes and neat twisted rib edgings make this a wardrobe staple. This sweater is seamless, knitted from the top down, and has set in sleeves. Instructions for 10 sizes are given: to fit bust 32 (34, 36, 38, 40, 42, 44, 48, 52, 56)”. Guidance for altering the sweater for a perfect fit is given at the end of the pattern. Needles: One 4.5mm / US 7 40”/100cm circular needle. Gauge: 19 sts and 28 rows = 4” in stocking st with 4.5mm/ US 7 needles. Extras: Waste yarn, 2 detachable stitch markers, spare 40” circular needle (size 4.5mm / US 7 or smaller). 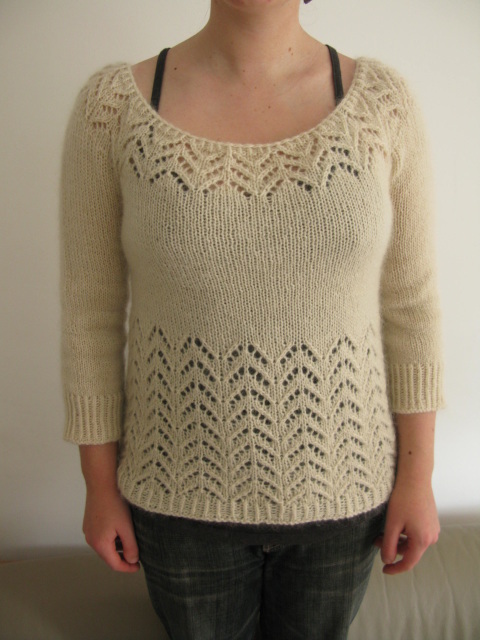 that your yarn matches the gauges specified for before and after blocking to achieve this. Instructions for 10 sizes are given: to fit bust 32 (34, 36, 38, 40, 42, 44, 48, 52, 56)”. (815, 895, 970, 1080, 1135, 1220, 1395, 1595, 1795) yards. Needles: One 5mm / US 8 40”/100cm circular needle. Gauge before blocking: 19sts and 26 rows = 4” in stocking st with 5mm/ US 8 needle. Gauge after blocking: 16sts and 22 rows = 4” in stocking st with 5mm/ US 8 needle. Extras: Waste yarn, 6 detachable stitch markers, spare 40” circular needle (size 5mm / US 8 or smaller). A flattering fitted sweater that’s quick to knit. The lace pattern is easy to memorise, and both charts and written instructions are given. The sweater is knitted from the top down with a yoked construction. All shaping is done by changing needles and stitch patterns. Extended advice on how to customize the sweater is also given. Yarn: Rowan Kid Classic 6 (6, 7, 8, 8, 9, 9, 10, 11, 12) 50g balls. Total yardage: 855 (920, 1015, 1105, 1200, 1290, 1380, 1475, 1660, 1840) yards. Gauge: 17 sts and 24 rows = 4” in stockinette with 4.5mm/ US 7 needle. Needles: One 4.5mm / US 7 40” circular needle, one 5mm / US 8 40” circular needle, one 4.5mm / US 7 16” circular needle and one 5mm / US 8 16” circular needle. Extras: Waste yarn, 3 detachable stitch markers, 4mm crochet hook.